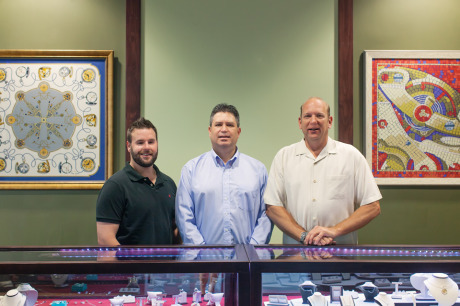 Hilderbrand Jewelers is customer focused, no sales pressure, Austin Jewelry store that will help guide you to the perfect piece of jewelry or watch. Rolex is our specialty, We offer some of the best prices for rolex servicing and repair. If you can’t find what you are looking for in store we have expert craftsman to create a one-of-a-kind, high quality custom design. With over 135 years of combined experience, Hilderbrand Jewelers is your one-stop store for diamonds, wedding and fine jewelry, sterling silver, watches and repairs. If you don’t see the perfect jewelry for you in our Austin showroom… Talk to us about creating custom jewelry, where we take your ideas and design the jewelry to your specific liking. Whether you’re looking for custom rings, engagement rings, necklaces, pendants or earrings. Visit our team of jewelers who are ready and willing to help you design the perfect piece of jewelry.